Whether your business is brand new or you’ve been around the block for decades, social media is a must-have for your online marketing strategy. We get a lot of questions from our readers about how to properly set up their social media business profiles. You asked and we’re here to answer! Before you get started, I recommend creating a new email account to register all your social channels. You’ll get a lot of emails from these sites and it’s easier to manage and filter from a separate email account. It can be as simple as social@yourbusiness.com. It’s also a good idea to have a separate email in case you ever hire someone to take over your social media accounts. (Email accounts are included with JimdoPro and JimdoBusiness, and you can always add extra accounts right from your Site Admin). If multiple people are contributing to your social channels it’s also a good idea to create a style guide. It’s important to create a consistent voice to have a strong presence on social media. The key thing to remember for social media is to do what makes the most sense for your business. Social media is not one size fits all. A major brand like Coca-Cola can afford to hire a team dedicated to social media, invest in advertising, and run elaborate campaigns to increase followers and promote sales. A small local bakery might have a barista double as a social media manager who occasionally shares posts and replies to customer questions online—and this can also work well. You’ll also find that not every social media platform is right for you, and some of that might just be based on your personal preference. You don’t need to spread yourself too thin by putting your business on every channel. Start off on a couple and master those before moving onto more. Facebook and Twitter tend to be the most popular. But if your business is highly visual, for example involving interior design, weddings, or photography, it might be better to start off on a platform like Pinterest. If your business is more corporate focused, LinkedIn might be a better place to start. If you’re still not sure, here’s a helpful rundown on the benefits of each social platform. Now, without further ado let’s talk about how to create a business page for each major social media site. If you don’t already have a personal account with Facebook, create one. You’ll need a personal account to create a business page. Don’t worry! Your name will not be associated with your business’s page unless you want it to be. To begin, watch this helpful video on getting started. Then scroll down this page and click on Create a Page. You can also choose the triangle icon on the top right corner of your personal Facebook account and then select Create a Page. Next, select what type of page you want to create. Are you a local business, artist, philanthropy? Choose the category most closely tied to your business. Select a category that best describes your type of business. After you pick a category, you’ll be asked to fill out some more basic information for your page. Customize the link to your Facebook Page: Try to make this the same name as your business and website URL. Choose a target audience: Choosing a target audience on Facebook means that your content will show up in the newsfeed of the right audience. If you haven’t decided on your target audience yet, you can skip this step. Otherwise, this is a good time to include your audience to start targeting the right people from day one. Design your page: This is the fun part! Your social channels should be a reflection of your website. Use the same colors and images you would use for your site and use your logo as your profile image. For Facebook and other social media channels, refer to this helpful list of image sizes for social media. If you need help creating a logo and cover image for your site, you can create your own beautiful images with Canva or get help from a professional designer with 99designs. What type of content should you post to Facebook? The main thing to keep in mind for social media is to post with purpose. It always comes back to your audience. What type of content do your followers want? Put yourself in your followers’ shoes and think about what kind of information, images, and content they’d like to see. Coupons, sales, and special deals: Did you know that over 74% of Americans rely on Facebook to influence their purchasing decisions? If you have an online shop, use Facebook to showcase your products and offer any coupons or special deals. This will also encourage people to pay attention to your posts because they know they’ll get something good out of it. 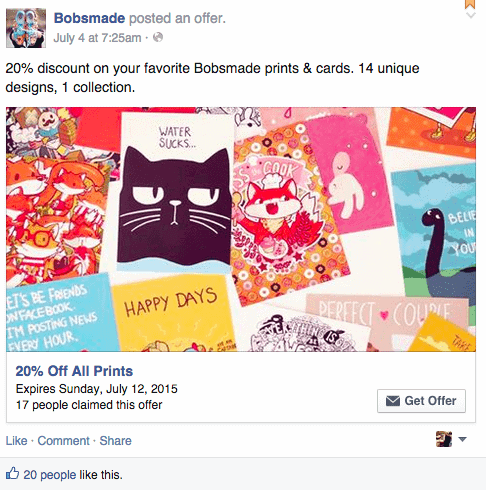 Jimdo user Bobsmade offers discounts to customers on its Facebook page. Behind-the-scenes look: Post pictures of your business and staff. For example, if you’re a bakery, show the process of pastries being made. This will help people get to know you and feel more connected. Questions/Fill-in-the-blanks: Ask your followers questions or format it as a fill-in-the-blank. News and updates: Anytime there’s a change in your business that customers would like to know about, share it on Facebook and the other social channels. This can include any reasons to celebrate (you baked your 1000th pie!) or changes to opening hours. Blog posts: If you have a blog, share short excerpts of the most interesting quotes from your post. Customer feedback: Social media is the perfect opportunity to talk directly to your customers and get feedback. For example, Jimdo customer Bobsmade invited customers to offer feedback on one of their designs. 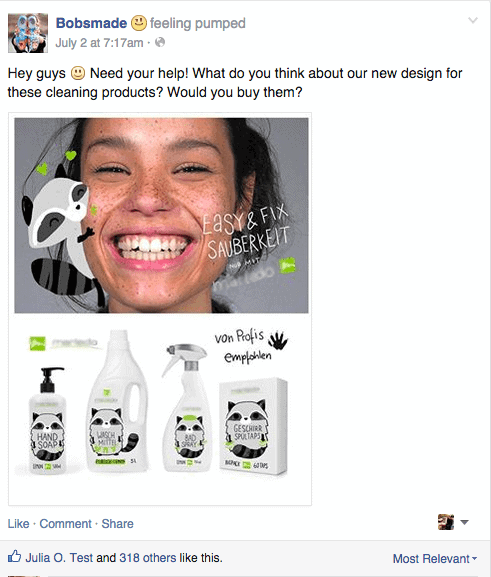 Use Facebook as a platform to get feedback from your customers. Regardless of what you share, social media scheduling platform Buffer suggests that the perfect post has a link, image, is 40 or less characters long, and is posted at non-peak hours. You should post one to two times a day to Facebook. It’s best to post a couple times at different points throughout the day to get the greatest reach. Remember that people have a lot of content in their Facebook Newsfeed so it’s good to post twice a day to make sure your posts are seen. To set up your Google+ Business Page, first, you need to claim your business on Google, which is an important step to take anyway. Then, simply go here to choose what type of page you are looking to create. If your business doesn’t have a physical location, choose Brand. If your business does have a physical location choose Storefront or Service Area. While Google+ isn’t on everyone’s list of first things to check in the morning, it’s still important to your social media strategy. It’s easy to maintain because you can mimic your strategy for Facebook and in the meantime improve your business’s SEO. That’s it! 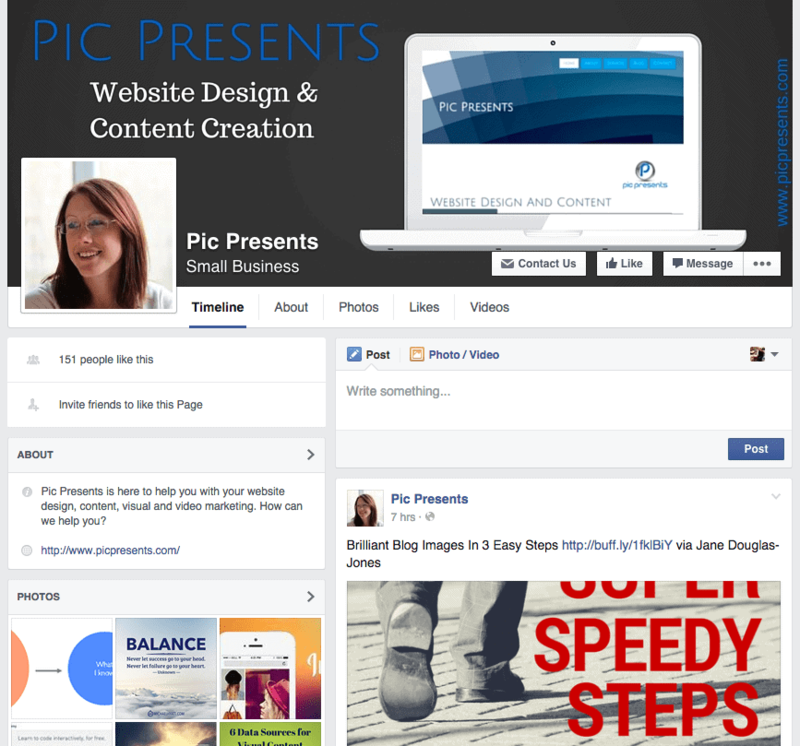 Now you get to design your page and make it your own. What type of content should you post to Google+? Sharing posts to Google+ is great for SEO. Because your posts will show in search results, you should start every post off with a headline. Videos also perform extremely well on Google+, getting about 28.6% more engagement. It’s also a good idea to share images and links accompanied by text full of (naturally occurring) keywords. You should also add hashtags and target your posts toward different groups on Google+. Post often on Google+ in order to get the highest level of engagement—you can post up to five times a day without losing followers or over-doing it. If you don’t have the bandwidth to post that frequently, don’t worry. Just get into the habit of cross-posting what you put on Facebook onto Google+ as well (with a bit more content/description added if you have the time). Twitter has one of the fastest sign-up processes. Simply go to the signup page and create your account. If the name of your business is already taken, try adding the abbreviation to your city or an abbreviation of your company’s name. For example, if you’re a coffee shop in San Francisco your Twitter handle can be @FillmoreCoffeeSF. Like with Facebook, take a moment to come up with a good cover image. You can use a tool like Canva or a professional graphic designer to help. What type of content should you post to Twitter? Twitter has the most educated audience of all the social platforms. Your posts on Twitter should be professional and concise—you are limited to 140 characters after all! Try to stick to sharing headlines or specific facts and information. People are quickly browsing through their feed and need to be able to digest the information easily. If you have room to share an image or video, do it! Videos and images are a great way to catch the eye of your followers browsing through their feed. Take a look at Jimdo customer Jane Douglas-Jones’ feed; she does a great job of mixing her own content and content from other users on Twitter. Attract more eyes to your tweets with big and bold images. On average, it’s best to post three to five tweets a day. To a small business owner that may seem like a lot, but you can always repost the same content and phrase it in a different way. Remember that people scroll through a lot of content on Twitter. So if you post a tweet at 7:00 AM your followers likely won’t see it buried with the rest of the day’s content unless you repost a few times throughout the day. To create a business page on Pinterest, simply signup and start pinning! What type of content should you post to Pinterest? Pinterest is the most visual of all the social media platforms. If you have an online shop, Pinterest is a great place to promote your products. Share individual product photos and link them directly to your individual product pages. If your business is more corporate, you can post images from your blog and infographics. You can also show inspiring quotes, funny images, or even video. No matter what type of content you share, be sure to edit the link of the image to drive traffic back to your site. Always link posts on Pinterest back to your website. Try to post a lot of posts at once, like five posts in one day. It will help your content show up in more feeds and increase engagement. A link to your website: One of the most important aspects of all your social channels is to drive traffic back to your website. Make sure a link to your site is easily accessible and visible to any visitor. See how Jimdo customer Jane-Douglas Jones makes the link to her website easily accessible from her Facebook page. About Us section: Every social channel has a section to fill out a brief description of your company. The length requirements vary but try to keep your description consistent across all channels. Contact information: If you’re a restaurant, shop owner, or other business, it’s important to include contact information to make it easy for people to reach out to you. If you don’t have someone dedicated to managing your social channels then all this posting, analyzing, and monitoring might seem like a tall order. But there are tools available so that you can schedule your posts on different channels all at the same time. In other words, you can get your social media posting done in a few minutes at the beginning of each day or week and it will be somewhat automated. Buffer makes it really easy to prepare, schedule, and post content. You can also easily repost tweets and Facebook posts that have performed well in the past and quickly edit the teaser text. HootSuite is another great way to track conversations about your business online, schedule posts, and follow others. Just remember that even when you automate social media, you will need to check in on it a few times throughout the day to answer any customer questions. Today, people expect an answer within 60 minutes of their post. Track your follower count: Perception goes a long way on social media, so it’s better to keep your number of followers higher than the number of people you follow. It makes your page look more credible and like you don’t just follow people to get followers back. Customer support: When it comes to customer support, it’s best to be as friendly as possible. Act online as you would in real life. Be incredibly friendly, empathetic, and solution-oriented. Everything on social media is public, so you don’t ever want to look like the bad guy in front of thousands of people. Keep your design fresh: After you’ve had your pages up and running for awhile, remember to keep your cover photo and profile image up-to-date. It’s also fun to switch these up for holidays or special occasions. Don’t be overly promotional: Nobody likes someone who just talks about themselves all the time. 70% of your content should add value for your followers (such as sharing blog posts, coupons, etc. ), 20% should be sharing other people’s content (posts from other businesses or highlighting customers), and only 10% should be directly promoting your business (such as “come by our store we have a new shipment of handbags!”). Analytics: Be sure to track your follower growth, what type of content performs the best, and how much traffic social media is driving to your website, and leading to sales. You can also measure success based on how often you interact with customers—ideally, you’ll start to see more engagement over time. Add social icons to your website: Once your accounts are set up, you can publicize them on your own website by adding sharing buttons or icons with direct links to your social media profiles. There you have it! Your all-inclusive guide to getting your business on social media. Feel free to post any questions in the comments section below and good luck!